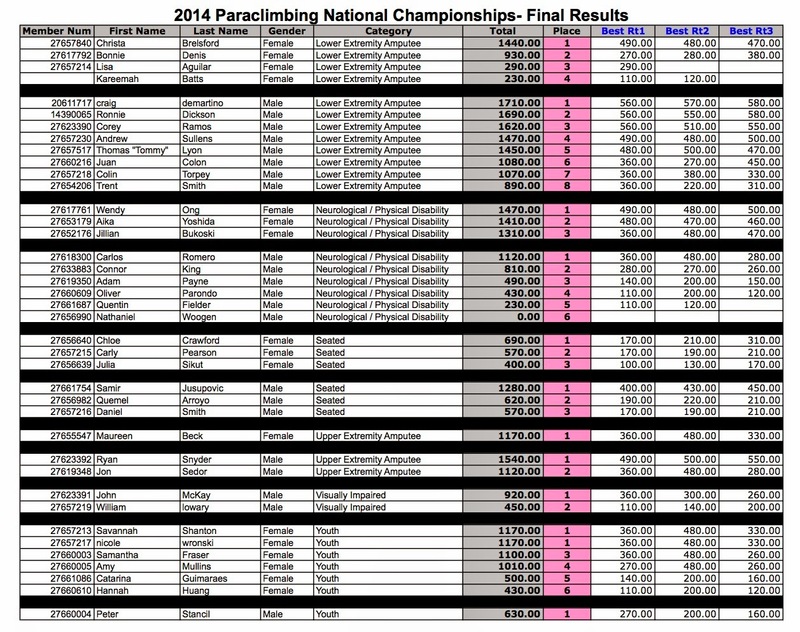 Following my win at the 2014 ABS Paraclimbing Bouldering Competition, I decided to train for and compete at the 2014 Paraclimbing Nationals, as it was a qualifier for the 2014 Paraclimbing World Championships (in Spain, which added much more incentive than say, Iowa – no offense guys!). Also, I just enjoy roped climbing much more than bouldering. 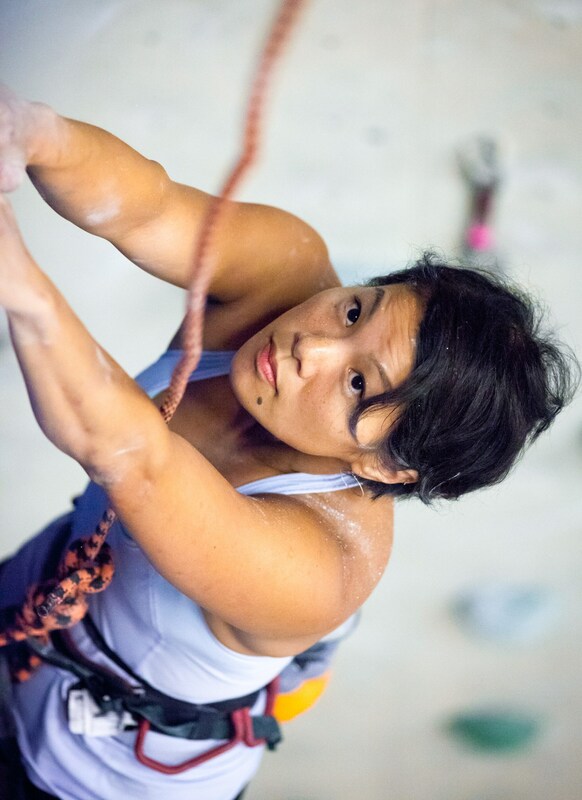 Mid-problem at 2014 ABS Nationals in Colorado Springs. I ended up winning not just my category (Neurological and Physical Disability) but also having the highest point score out of all females. I received this information on Wednesday afternoon. I was to fly out to Atlanta on Thursday and the competition was on Friday, July 18th. Yes, hardly the best timing. Many emotions as well as starting to weigh the benefits-risk of competing ran through my head. This kind of injury needs rest, immobilization and usually several months of healing. But, I had been climbing through the pain for awhile now; travel expenses to Atlanta were paid for; and this was a competition I had prepared for and served as a qualifier for Spain! But I know my priority lies in having a long climbing future climbing outside with wonderful people; I didn’t want pulling on plastic indoors to cause permanent injury to my finger and affect the long-term range of motion of it, for climbing or for every-day work reasons. I have been buddy-taping like crazy and am typing with effectively 9 fingers right now, which is a bit awkward and also makes me want to change my counting to base 9. So there was the dilemma of risking long-term damage or competing. And if I did compete, it seemed like a lose-lose situation. I would be sad if I didn’t place at all (top-3 go to Spain); I would be pissed if I didn’t come first because of my injury; and if I did win, I would feel like it was a hollow-victory because I didn’t have to climb my best :-/ Yes, I realize my mind-set is sometimes problematic. Many people advised me to do just enough to place and not further injure my finger. I agreed, but knew I would not be happy with just placing. You would think that I would be better at keeping all this in perspective, after the much more severe traumas and health issues I have been through. I climbed extremely conservatively, probably only 30% of my capacity. I really hate not giving things my all. But, it was enough to place first, not only in my category (Neurological) but also across all the other female categories, making me the Paraclimbing National Champion. I guess it was the best possible outcome; first place without further injury. But as you have probably come to learn, I still feel slightly unsatisfied that I didn’t go out and crush/climb my hardest. It was wonderful to meet other members of the para-climbing community. I was especially impressed by the dedicated adaptive climbing programs for kids around the country! It was an honour to be a small part of this growing movement. I later found out that both fingers were broken. I was surprised to be featured as much as I am in this video, as I often think that I am not a particularly “marketable” poster-child for paraclimbers/para-athletes/people with disabilities. 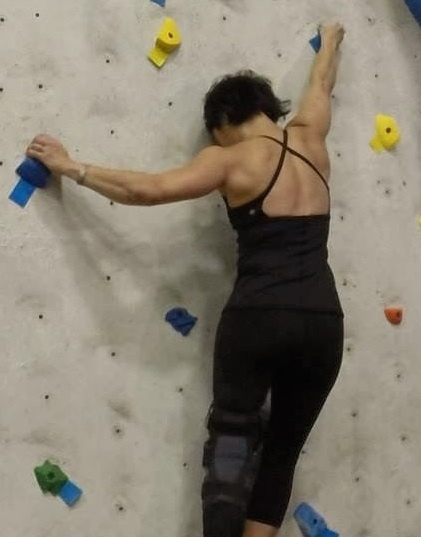 It was instructive to see myself climb; I notice that I waste a bit of energy “tugging” on holds to check how secure I am, rather than just dead-pointing and latching on to them. A friend remarked that I climb indoors as if I am climbing outdoors, where I am often testing the rock/hold out. Oh well, it’s not necessarily a bad habit, I think. It just means I have to be conscious of the differences climbing on secure plastic holds versus sketchy hollow flakes.